If you’re the type of person who loves to go for a run, then for sure you are always in search of the best water bottle for running. It’s important to stay hydrated and there are basic guidelines for water intake before, during, and after exercise. There are a lot of bottle types available like the soft flasks and BPA-free plastic bottle specifically designed for running. These bottles have a lightweight, comfortable grip, hand strap, and zippered pocket to name a few features. So, if you want to find out which are the best handheld water bottle for running, read along to see our recommendations based on positive feedback from users. Which Water Bottle Should You Use? The CamelBak Quick Grip Chill Handheld Water Bottle offers cool water in your hands during a tiring run. The pack includes a zippered pouch and the overall weight is only around 40g or 1 oz. The bottle fluid capacity is 21 oz which is still a fairly comfortable weight to carry. The bottle is insulated which effectively keeps your water cold for a long period. It has a self-sealing JetValve technology that makes it leak proof while giving you a high flow of water. The bottle is easy to squeeze so that you can control the amount of water you want to drink without experiencing splatters. One drawback that most users find is that the zippered pocket on the bottle carrier doesn’t fit large phones. Despite that, it does an effective job in keeping cards and cash in. Its extra stretch mesh can fit energy gels. It also has a clip for your car keys and an adjustable cinch strap, helping you securely carry your valuables as you run. The bottle has a patented TruTaste technology and is BPA free which will keep your water clean from start to finish. It has a lightweight ergonomic design that makes it one of the best bottles for runners. This bottle is also one of the bestselling running water bottle on Amazon. The Nathan Insulated QuickShot Plus Flask has a carrying capacity of 300 ml or 10 oz, which is a great carrying weight when running. Despite its small size, it effectively keeps your water cold for 20% longer because of its insulated hydration packs. It offers high vision reflective 360-degree visibility that can make you run safer. The pack comes with a very comfortable hand strap with a thumbhole. It offers a good grip and requires less effort during running, so you can keep your hands relaxed. The soft flask has a high flow race cap which can give you fast bursts of water for short distances. While a lot of users find this product useful, some say that it is hard to remove the flask out of the hand strap. Although, it does make up for it by having a nice expandable zippered pocket with a great amount of storage for your keys, cash, cards, and other valuable items. Unlike the Nathan SpeedDraw Plus Insulated Flask, the QuickShot is smaller in capacity and rounder in shape, so you have to choose between the two if you’ll have a longer or shorter run. Other features are still the same and it’s up to you which one is the better pick. The FuelBelt Helium Sprint is a 10 oz BPA free ergonomic bottle that is considered one of the lightest running bottles. It comes with a Velcro attachment to keep the padded hand strap secure and comfortable. Because of these notable features, in our opinion this is the best handheld water bottle for ultra running. The flask has a soft silicone push pull bottle cap that makes it easy to draw water while running. It’s very simple to open it and take a drink without having to stop. It fits very well in the hand and doesn’t leave a plastic taste on the water while it relatively stays cool. A lot of people vouch for this FuelBelt model although they say that the strap is not detachable. But what’s also great is you get to wash it together with the flask, so you’re sure that the strap is clean after every run. Overall, this is a very light, compact, and easy to use bottle to bring while running. Despite lacking the good insulation features of a water bottle, it can still keep water cool during your run. And because of its light weight and great features, it is one of the best ultra running handheld bottles in the market. We go through hundreds of products listing at Amazon and also study the ratings left by previous buyers to find the best water bottle for running. Besides that, we also calculate the overall net ﻿﻿customer satisfaction (NCS) grade because we want to see how happy is the previous buyers with their purchase of the product. From our finding, we can say that CamelBak, Nathan and FuelBelt are the best water bottle for running brands. These brands are popular and received many excellent ratings for their products. Also, the CamelBak Quick Grip Bottle, Nathan Insulated Flask and FuelBelt Helium Sprint Ergonomic Bottle score favorably for the ratings as well as the NCS grade compare to the rest. We believe that you would find thesewater bottle for running a good buy too. The type of material used to make the water bottle is very important in determining whether or not it is suitable for running. The most common materials used are stainless steel, plastic or glass and each type has their pros and cons. The material should be lightweight so that it can be easy enough to carry during running. Water bottle meant for running should have a reflective material that can reflect any kind of light. Aside from keeping you safe, this will remind you to hydrate constantly during your run. The weight and size of a water bottle are very important factors during running especially if you’re considering a handheld water bottle. Running with a big heavy bottle can be difficult and make you slow down and get more tired easily. You need a water bottle that is lightweight and compact enough to bring with you. 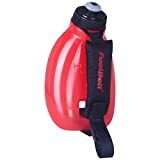 Handheld running bottle can carry around 12 ounces of water, while the 2 to 4 pieces of smaller bottles worn on waist belts can accommodate around 6 ounces of water each. So, when you are out to purchase your bottle, remember that these are the comfortable weights for running bottles. There are many different water bottles available in the market and each one can cost differently depending on the features. Bottles with stainless steel material are more expensive compared to plastic. Of course, the more features a bottle has, the more expensive it can be. Buy one that will fit into your budget and with extra features that will benefit you. Since you’ll be running with your bottle, it should have a bottle holder or carrier that will make it easy to bring. This is like a vest for your bottle where you can fit your hand in easily and also has pockets for other valuable items like phone keys or cards. Other than that, the shape of the bottle should fit nicely in your hand which should add more comfort in carrying. A water bottle can have either a narrow or wide mouth gape and choosing one will depend on the type of activity being done. Narrow mouth gapes are more comfortable when drinking. On the other hand, wide mouth gapes make it easier to put in ice, fruits to infused the water and to clean. But if you can put it in the dishwasher, then a narrower mouth gape is the better option. Some insulated water flasks have double wall features that helps regulate the temperature of the drink inside. This feature makes it great for extreme temperature fluctuations in different locations or weather conditions. Nozzles are like a straw and work with a push pull snap action. Most nozzle are bite valves which need some pressure from the teeth if you want to get more water. Nozzles with push pull action are great for running and you can control the amount of water that comes out with a press on the bottle. There are different types of water bottles that have different uses depending on the sport activity. For example, a running or jogging water bottle is different from a hiking water bottle. You can find many kinds in the market but here are the most common ones being used. There are so many bottles to choose from and most of those offer the same function which is to keep you hydrated. But these bottles also have different features that make them specific for different kinds of activities. In choosing running bottles, remember that it should be something lightweight, easy to hold, and can carry the right amount of water for you. Keeping your water bottle clean is very simple. But it’s important to ensure that you clean it well to avoid bacteria from building up. This can prevent your bottle from stinking. Just rinse the bottle with warm water right after using it. Then wash with a bottle brush and mild soap, and thoroughly rinse again with warm water. Let it dry facing down to drain out the water. Also, after a strenuous run, microtears occur in your tendons, muscles and other tissues throughout your body, but specifically in your legs. Amino acids found in protein will help to heal and repair the tissues damages. Protein shakes either the ready-made protein beverages or the powders mix with water or milk can provide a rich dose of these amino acids your body can absorb faster than through whole foods. Besides that, protein also provide many other benefits like reduced inflammation, increased strength exertion and more. So, it’s vital to take a good amount of protein drink after a run to help your body help faster. Check out some of the best protein shaker bottle you can use to make a quick and delicious protein shake on the go. When you are doing a physical activity such as running, staying hydrated is vital. That’s why the best water bottle for running should be something which you can bring along with you, allowing you to have water anytime during your exercise. If you’re looking for one, then our top 3 picks are highly recommended and they are excellent as marathon water bottles too. It is good to invest in an affordable, durable, and useful water bottle with features that will benefit your run. Doing strenuous activities can make your body lose a lot of water and keeping yourself hydrated will help you have a balanced electrolyte system to keep your body functioning.